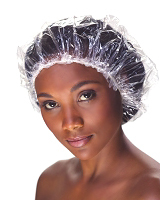 Protect hair during facials or wet treatments. May also be used for deep conditioning treatments. These caps can accommodate any length or style of hair. Package contains 100 disposable caps.